Today I wanted to share a sneak peek of the rustic elegance, styled wedding inspiration “Emerald Apparition”, that we created for the latest edition of Luxe by Calgary Bride at the always spectacular, Emerald Lake Lodge. I was extremely fortunate to collaborate with several of the most talented, creative wedding professionals in the business: including the fabulous husband wife team Trish and Matt of F8 Photography, and the talented Lyn Chapman of Flower Artistry among others. I had so much fun creating this rustic, elegant wedding inspiration! Stay tuned as we have many more beautiful photographs and details to share with you! Photography: F8 Photography; Designer / Designer & Stylist: Naturally Chic; Florist: Flower Artistry; Venue: Emerald Lake Lodge; Linen: Celebration Creation; Makeup: Canmore & Banff Makeup Artistry; Hair: Mountain Beauties; Cake: Buttercream Bakeshoppe; Stationery: Collaboration Plush Invitations + Naturally Chic; Bridal + Flower Girl’s Attire: Cameo and Cufflinks; Groom’s Attire, shoes and cufflinks: Ed Williams Menswear; Wood Arch + Wood Details: created by Naturally Chic; Decor: Naturally Chic, Flower Artistry, Great Events; Models: Tyler Trapp and Bailey Christensen, Molly & Mim. Contact Naturally Chic for more information on planning your mountain wedding! Naturally Chic is featured in Luxe by Calgary Bride. It is a new wedding publication that is filled with beautiful and luxurious inspirations for brides. It’s filled with serious eye-candy; dresses, jewelry, stunning tablescapes and more! One of the best features of the publication? The mag features tons of local wedding resources: venues, florists, photographers, planners and designers and more. We were absolutely thrilled to be asked to design a couple of eco-friendly tablescapes for the premier issue (on newstands in and around Calgary). We designed both a summer wedding table and a winter wedding tablescape. We’ll be blogging about the winter shoot in the next few days. In the meantime, pick up a copy of this beautiful magazine. If you are looking for inspiration for your wedding, you won’t be disappointed! For more information about our planning and design services visit us at www.naturallychic.ca or drop us a line at hello@naturallychic.ca. Have you seen the latest wedding magazine available to Calgary and area couples? It’s Luxe by Calgary Bride (the same great people who put together Calgary’s most comprehensive wedding resource; the Calgary Bride). This new magazine is pure eye candy featuring some of the area’s best wedding professionals and it’s loaded with some of the most beautiful and creative wedding inspirations to date! The premier issue is out on newstands everywhere including Chapters/Indigo. It is truly a remarkable magazine and a beautiful keepsake. We are so honored to be featured in this gorgeous new publication. Naturally Chic designed two stylized wedding shoots for the magazine including a summer, eco-chic inspiration and a luxe winter tablescape. Both shoots feature our custom design and wood creations, and we were so fortunate to collaborate with some amazing wedding creatives including Rebecca Dawn Flower Design. All the beautiful photos from both shoots are from the very talented f8 Photography. We are super excited about sharing this feature with you all! If you don’t already own a copy, pick one up today; you won’t be disappointed! For information on our planning and design services, visit our website at www.naturallychic.ca or contact us at 1.888.679.9056, or send us an email at hello@naturallychic.ca. We’d love to hear from you! Today I wanted to share an article that I wrote that was published in the Fall + Winter 2012, Calgary Bridal Guide. The Calgary Bridal Guide is an amazing resource for Calgary and area brides and is chalk full of inspiration, ideas and information on local wedding professionals. If you are getting married, pick up a copy at Chapters/Indigo today and you will be so happy you did! You can also check out the Calgary Bride website for more great information. The article I wanted to share with you is: Shades of Green; Anyone Can Have a Beautiful Eco-Friendly Wedding! We really believe that anyone can have an amazing, eco-chic wedding by incorporating some of the tips found in this article! An eco-friendly wedding is any wedding where the couple tries to minimize its impact on the planet, and there are many ways to do this without sacrificing style or elegance. Eco-chic weddings can be every bit as beautiful as conventional weddings but without all the waste. Incorporating earth-friendly choices into your wedding doesn’t have to be difficult. Every year, millions of weddings produce tons of waste. As an engaged couple, you’ll make many decisions while planning your wedding and almost every aspect of a wedding is an opportunity to consider an eco-friendly option. Whether you want to incorporate only one earth-friendly option or completely offset your carbon footprint, anyone can have a green wedding. There are many shades of green! Having a green wedding can be as simple as making good consumer choices and supporting your local economy. When choosing a venue look for one that has environmentally friendly practices that meet your values. Whether you are hiring a photographer, videographer or wedding planner, make sure their values and practices are a good fit with yours. With wedding stationery, consider skipping the save-the-dates or invitations altogether. Send e-vites instead. If you do send a physical card, work with a company that makes beautiful, sustainable products. Have your guests call or email you their reply. Set up a wedding website where guests can find wedding itinerary and relevant information. If you’re in a beautiful natural setting, highlight it. 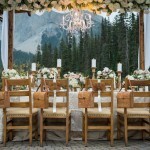 If your ceremony is set against a beautiful mountain backdrop, you won’t require much decor to make it beautiful. Consider incorporating natural elements into your decor such as twigs, pinecones, moss and other greenery. Rent instead of purchase decor items that you’ll use only once. When it comes to attire, consider clothing for the groom that can be worn after the wedding. A rented suit is another option. The bride could donate her dress to charity after the wedding or sell on EBay for someone else to enjoy. Choose jewelry made from gems or stones and only purchase conflict free diamonds. Wood wedding bands are a super chic option! With wedding gifts, consider registering with companies that provide green and sustainable gift items. Support local artisans that make unique or one-of-a-kind jewelry, woodworking and art for bridal party gifts. Have meaningful or useful favors that will actually be used and enjoyed. Edible favors are almost never left behind! Or, select a meaningful charity and make a donation in your guests’ name. Whatever you decide for your wedding, make choices that are right for you as a couple. Remember every green choice makes a difference. If every couple made even one green choice, it would have an amazing, positive impact on the environment! For more Eco-Friendly wedding tips you can download our Green Wedding Guide on our Naturally Chic website. We are so thrilled to be featured on one of our favorite blogs the Calgary Bride! We were featured on Earth Day and didn’t have a chance to post about it until now. If you haven’t had a chance to check out the post, we would love it if you pop over and take a look. Thank you so much Calgary Bride for featuring us! For more information or to book us for your wedding planning and design, call us at 1.888.679.9056 or email us at info@naturallychic.ca! Or, visit us at Naturally Chic.